It was a tough first week of May as I was sick with a cold from the events. Friday night was certain the end of the craziness as I got to see Grand Analog return to Ottawa as part of Prairie Scene. If you’re wondering why there’s a Hip-Hop band in the Prairies? The frontman, Odario Williams was originally from Winnipeg, Manitoba but he’s now based in Toronto. Overall, I had a great time at their show at Ritual Nightclub. I also brought along someone to help me interview the band. I got to thank Tiffany for assisting in the interview. The funny part was airing the long interview on Wednesday’s radio show. I apologize if it was very lengthy. Another message to bring up. I haven’t been able to update the top 10 entries from the Wild 10 Countdown on the blog as I mentioned that I have been sick and I just forget to update. Please bear with the delays as the top tens will eventually be posted up. You can check out the playlist at this link. 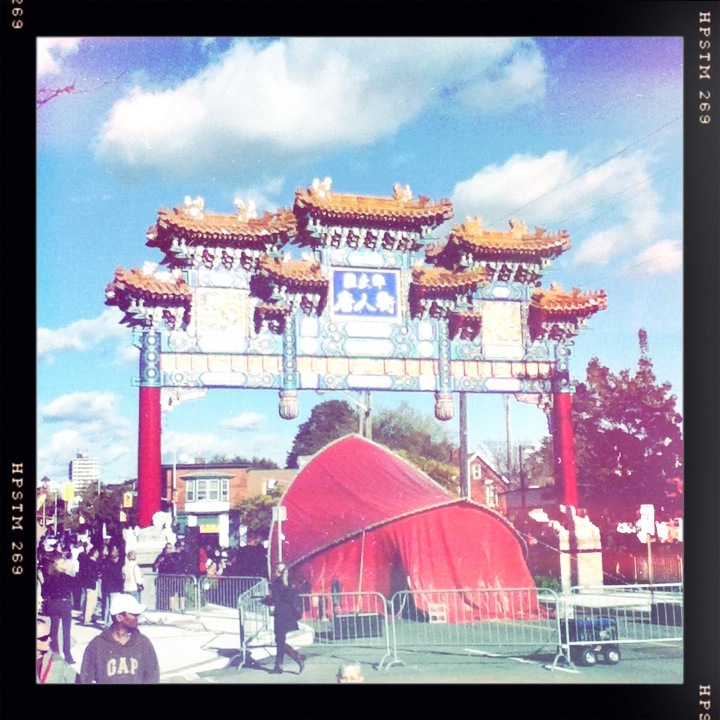 On the (Canadian) Thanksgiving weekend, I had an opportunity to check out Rich Aucoin and Hey Rosetta! over at Capital Music Hall. Hot Hot Heat was the headlining band but decided to leave because bus service on Sunday night in Ottawa is not the best. I had the opportunity to interview Rich Aucoin as he was available to interviews and I was totally fine with it. Aucoin is one of those up and coming musicians who’s making interesting sounds to the Canadian music scene. You can say he blends a mix of Daft Punk and other techno bands from his music. For the live shows, it is very interactive as I got to experience the confetti, balloons, 3-D glasses and a parachute. His set was the most energetic. I hope you will enjoy the interview. Wednesday’s radio show continues to be fun as I am very comfortable with the new co-host, Marzia. She is giving me more of a perspective on the alternative bands that she likes and the ones not getting a lot of airplay on mainstream stations. This week, we talked about OK Go as they are coming to Ottawa later this week. Overall, she is getting comfortable being on-air in Ottawa, Canada and she told me it was chaotic at the radio station in her hometown of Italy. I began a new opening music as CKCU-FM will be celebrating their 35th anniversary and it’s fitting to use Anniversaries by The Love Machine as they are one of the bands that will be performing for CKCU’s 35th anniversary. I also aired the 2nd part to the Grand Analog interview from Montreal. What was dealt in the second part were mentioning the Winnipeg music scene (in a humourous fashion), being friends with Shad, the Polaris Music Prize and the use of social media/network site. I started the show with something nostalgic from the 1990s. Got to love music from England at that time period. Here’s the music video. Don’t forget to check the playlist by clicking on the link. The top 10 countdown is at this link. The October 13 edition of the radio show. Press play to listen. The Rich Aucoin Interview – Press play to listen or download it. The 2nd Part of the Grand Analog Interview – Press play to listen or download it. I participated in this website project about everyday people in Ottawa. Thanks to Hello Ottawa, you can read about myself at this link. Wednesday’s radio show was the post POP Montreal edition as the top 10 countdown had some bands that attended the music festival and then later on, I aired two interviews by Grand Analog and Think About Life. What’s new on the radio show is that I got a new co-host. Her name is Marzia and she’s an exchange student from Italy. So, be kind to her. She’s been a great addition to my show as she’s enjoying the music that I am playing. I started off the show with a couple of Anita Mui songs because October 10th, would of been her birthday if she was still alive. It was another tribute to the “Madonna of Asia.” First song was her rendition of Stand By Me because a good friend has been fond of the original version by Ben E. King. I decided to play it again for her. As I explained in the previous blog post about the various activities I did at POP Montreal like hanging out with two members of The Balconies and The Golden Dogs for poutine in Montreal. In the second hour, I made the new co-host happy by playing The Hundred In The Hands, Delphic and The Temper Trap. I attended Saturday’s show by checking them out. They were pretty good. One thing I forgot to mention on air was who are PKG? They are a Canadian company and they make electronic accessories like laptop sleeves/bags, iPhone cases and other tech carry-on. The fine folks from PKG had me do a giveaway for the radio show. It was grateful of them to do another one after POP Montreal. It was pretty tempting to not get hooked the messenger bag I gave away. Congratulations to Tom Burns (of Ottawa) for winning the awesome messenger bag. Kudos to last week’s winner, Tanya Poirier (also of Ottawa) for winning the PKG/POP Montreal VIP giveaway bag. Thanks to PKG for displaying an excellent room at the POP Montreal headquarters (Notman House) and for the giveaways. Don’t forget to check the playlist by going to this link. The countdown entry is at this link. You can listen to the radio show by pressing play. Grand Analog – Part 1. It’s in part 1 because the length of the interview was long. Press play to listen or download it. Press play to listen or download it. It was totally last minute as I decided to do some guest hosting for 12pm on Thursday at CKCU-FM. Instead of 30 mins, it went to 2 hours. As I ended the show, I decided to sneak in Imagine by John Lennon. What I didn’t realize was his birthday would be on October 9th and he would be 70 years old. Talk about ironic timing. Press play to listen and the playlist for the show is at this link. 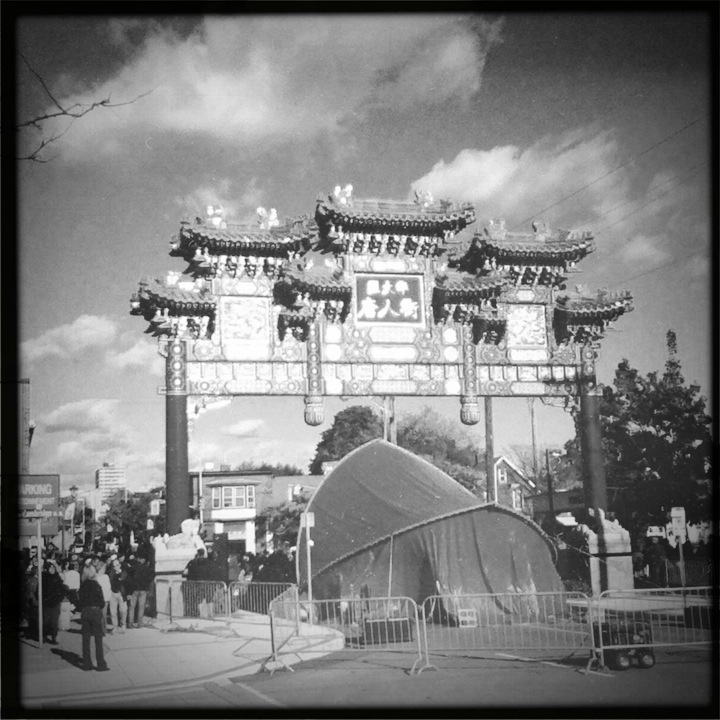 Following the guest stint at CKCU-FM, I had to go to Ottawa Chinatown for the official opening of the Gateway. The official opening had dignitaries and politicians for the unveiling. Here are a few photos I took. The Gateway looks lovely. Coming to Montreal to attend Pop Montreal was fun. 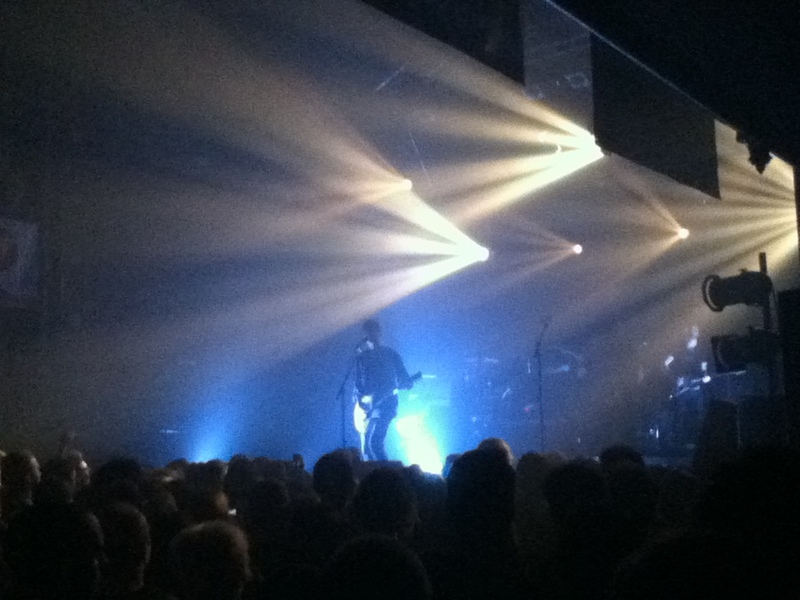 Pop Montreal is an annual music festival that showcases International and local music through various venues. Being my first time, it’s quite enjoyable. Although, I didn’t get a chance to see some of the acts I wanted to see, it was mainly due to walking and taking public transit around to various places. I seem to have gone to Le Divan Orange several times because there were free shows happening in the afternoon. My own problem was not preparing on who to check out as everything I did was on the fly and unexpected. 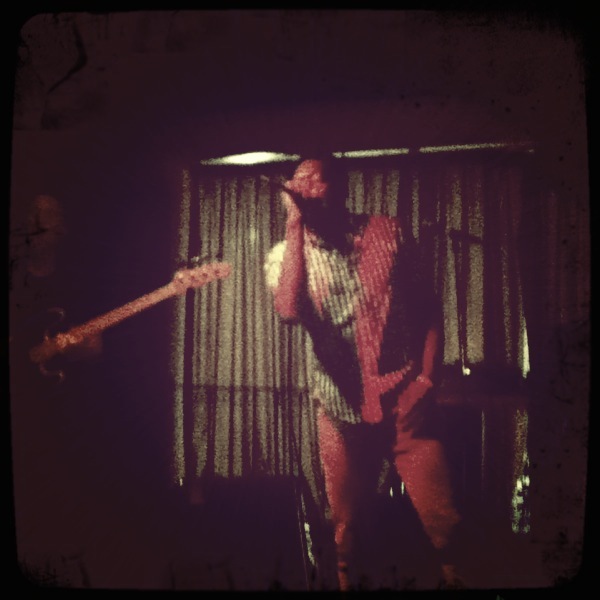 Friday night, I went to The Jukebox to see Grand Analog. Odario Williams and his band members (minus one) were surprised to see me and I haven’t seen them in awhile. They had a great set and it’s been awhile I heard their music. Before getting inside to The Jukebox, I finally tried Schwartz’s smoked meat sandwich. Luckily, it was across from the venue and had time to waste as I arrived early. Saturday’s lineup was a lot to check out but I chose a few to attend. The Notman House (Pop Montreal headquarters) had a Pop BBQ Show featuring The Whitsundays, Hot Panda, Maylee Todd, Forest City Lovers and others. I went for the food as I only checked The Whitsundays perform. Afterwards, I took the bus to Le Divan Orange to see Think About Life. It was a packed show as they couldn’t let any more people in. They rocked out a energetic half an hour set. I did the interview with the lead singer of the band and expect to be aired soon on CKCU. After Le Divan Orange, I had to go further up to Ubisoft Montreal. Yes, it’s the videogame company. They are one of the sponsors and that event was called Pop The Roof. 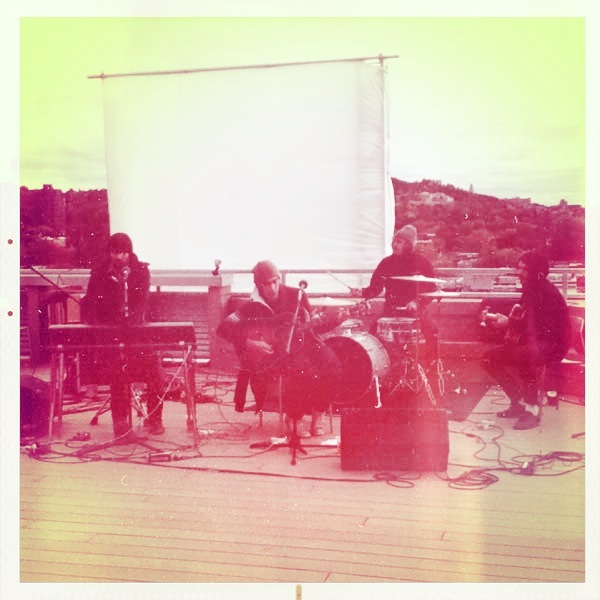 The photo above was Malajube performing at Ubisoft Rooftop. That was probably one of my favourites because being at the rooftop felt nice. Seeing the backdrop of Mont-Royal and downtown Montreal made it felt surreal. The secret party for Pop The Roof had good crowds and there were free food being served. The next one was going further down to St-Catherine to go to Le National as I was recommended by a new volunteer at CKCU. She told me to check The Temper Trap and having a media pass, I didn’t need to pay. 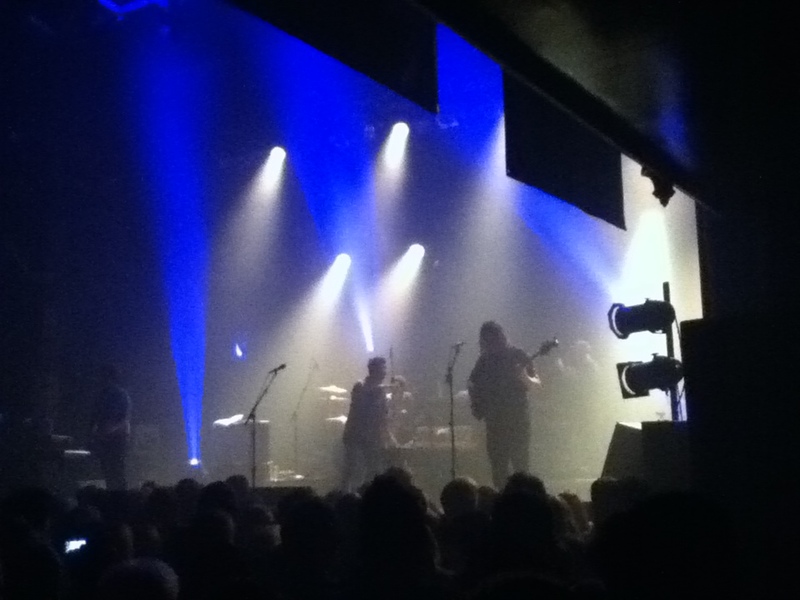 The opening acts at the show were The Hundred in the Hands (New York) and Delphic (from UK). Those two bands were electro-rock based and they had catchy tunes. Then came The Temper Trap. Their music is alternative music with grand sounds. Their first tune, it seemed epic with the drumming. I know it’s Montreal as the show was packed, but I never knew the band has a good fan following. The unfortunate part is that the same lineup will be in Ottawa for Sunday night. After checking out the fabulous show, I headed over to 3 Minots to find The Balconies and Laurent Bourque (along the Old Crowns gang minus their lead member) to pay them a visit. They were surprised to see me in Montreal. It was tough to get in 3 Minots as it was at capacity. I did hang out with Jacquie, Liam, their friend and The Golden Dogs for poutine. Overall, it was an amazing Saturday I had at Pop Montreal. Not sure what to check out on the final day of Pop Montreal. Note: One of the proud sponsors of Pop Montreal, PKG, were kind enough to give me another giveaway for my radio show on CKCU. Keep tuned to it. Here are a few photos that I took from the iPod touch. 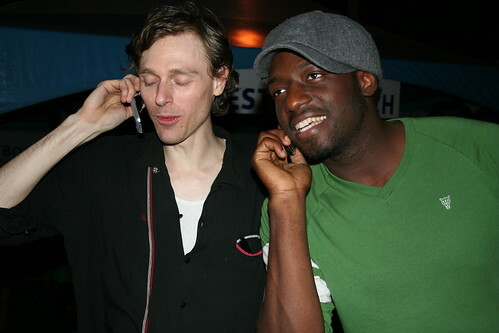 Joel Plaskett and Odario Williams on their Phone, originally uploaded by Lenny W.. Funny photo of Joel Plaskett and Odario from Grand Analog. Joel happened to be on the phone and Odario pretended to be calling so he can be cool about it. It was an amazing Friday night at Westfest because their concert lineup consisted of Hurray for Higgsfield, i see rowboats, Matthew Barber and the Union Dues, Grand Analog, Land of Talk and Joel Plaskett Emergency. The host for Friday’s National Night was none other than Amanda Putz. She’s just the best host/MC around and amazed she did not goof up unlike her stint on her weekday morning show on CBC Radio 3. I was there since 4pm (I’m probably lying, LOL) until around 11pm. I was somewhat worried about the hot weather but the concert ground was shaded and there was a breeze. The last time I saw Joel Plaskett was at Winterlude in February and I basically froze to death. Let’s say that I stood for over 2 hours. This time it’s the reverse and still a great crowd for the indie rocker. I got into a bit of trouble at the end of the concert because the members of Grand Analog remembered and recognized me from the Fuse taping in November and through MySpace. Let’s say that the security was not pleased about giving the artist pass. It was somewhat a funny moment because the members of Grand Analog and myself were causing a bit of trouble entering the VIP section. I was happy to see Ming (not my twin brother) and Saeed come to Westfest and check out Grand Analog and a bit of Joel Plaskett Emergency. I wish they had a chance to meet Odario and the gang. Hopefully next time when they return to Ottawa for a gig. As you from the photo on top, that was taken after the concert and it was nice of the group and Joel Plaskett to join in for the photo op. For those who missed it (you know who you are), you should of went and checked it out because it would of been a fun time. As I finish up this entry, don’t forget to check out my Photos from Westfest 2008. This might be a spoiler because the airdate for Fuse will be on January 12, 2008. I really enjoyed Tuesday night’s taping of FUSE. The performers were Grand Analog and Dr. Draw. I was happy to see Grand Analog perform because the last time I went to a different CBC radio taping, they were in Ottawa. The funny thing was that I added Odario William on MySpace after the Glen Gould special for CBC Radio 2 and a few days later, he messaged me how he liked my display picture. Overall, it was the best FUSE taping and a kind of a make up of sorts because I didn’t get to go to The Sadies and Gord Downie fusing. Link to the photos at http://flickr.com/photos/lenny-wu/sets/72157603315126606/. Another concert I went was on Saturday, November 24, 2007. It was The Russian Futurists w/ The Consecos and Tallships. Link to the photos at http://flickr.com/photos/lenny-wu/sets/72157603288988525/.